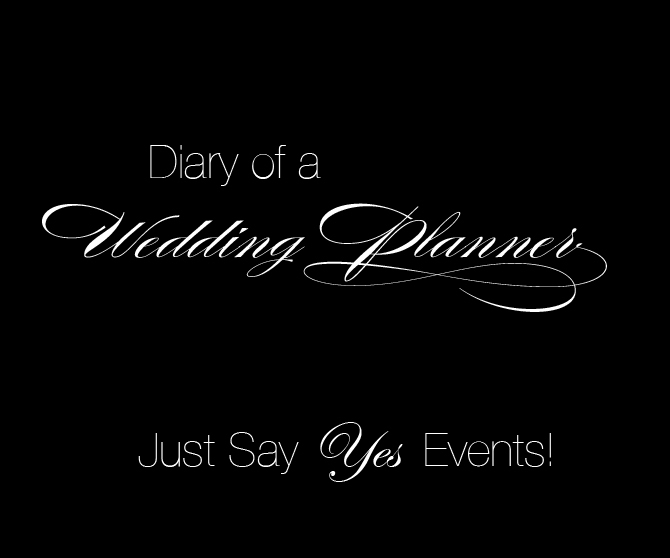 Just Say Yes Events: The perfect venue. For those of you that frequent our blog you know that I was married this June to my fiancee and love of four years Daniel Mouradian. There was so much planning put into our wedding and so many small details that I will be selecting one detail, vendor or element and blogging about them individually. I love that we are both in the creative industry and we would be able to design EVERYTHING! I am the Senior Creative Director for Just Say Yes Events and Daniel is a Senior Art Director for an Creative Agency here in Chicago. The creativity between us on a daily basis is absolutely insane with constant ideas of creating and design everything from art to furniture. Once the planning started it was actually very easy for a few reasons; The first reason is very obvious, I'm a wedding/event designer and the second Daniel and I have very similar styles as-well as likes and dislikes. We both agreed very early on that the wedding would be black and white and definitely a black tie affair. Daniel and I love getting dressed up and feel one should do so for a wedding as it is a very special occasion. Once we had a direction and style we were going in we set out on finding the right location. For my 27th birthday Daniel took me to ZED451 with some friends and I told him that I wish we could get married there. 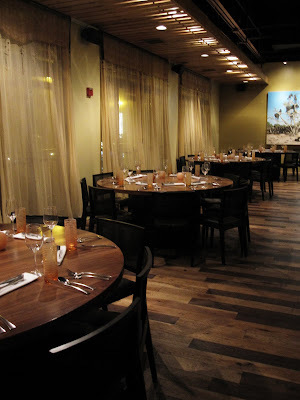 ZED451 is American Churrasco so I knew the food would be amazing and its gorgeous inside. The decor inside ZED451 is contemporary yet warm with wood floors combined with leather and a few event spaces all different in design which is nice. They also have a massive roof top right smack in the middle of downtown that has three cabanas, giant bar, outdoor fireplaces and lounge areas. This was the place and we both knew it so we BOOKED it! ZED451 was fantastic during our planning process and it helped that a friend from my modeling days Sammy Ojeda is the Event Manager at ZED451. She helped immensely and we couldn't have asked for a more perfect venue planner than Sammy. We started with figuring out what space we would use for our ceremony which was really important to us as that is the most important part of the day. 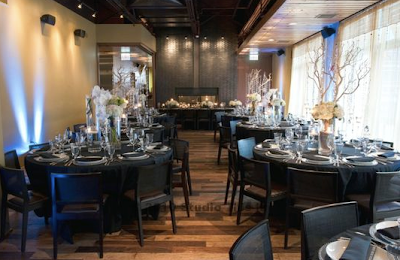 For the ceremony we selected The Fireside event space which is on the second level of the restaurant and has a wonderful warm feeling with hardwood floors, double sided floor to ceiling fireplace and Juliet Balconies. 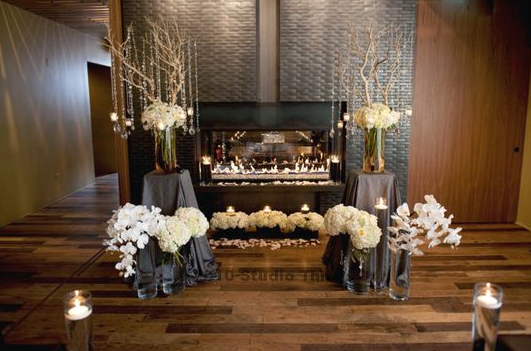 The ceremony was to be set up directly in front of the fireplace....Can you say ROMANTIC! After that was settled we moved onto the cocktail hour which was suppose to be downstairs in the massive bar area that has lounge areas, fireplaces & gorgeous decor.......But Dan had his eye on something else! Dan wanted the rooftop.....CRAZY! I loved the idea but I knew the restaurant would be hesitant as that is their big money maker during the summer. With the motto of whats the worse that can happen? they say no?!?!? We asked ZED451 what they could do for us and they said YES!!! I died with excitement, we would be hosting a full TWO hour cocktail reception on the rooftop at sunset. Okay now i know I said this earlier but "How romantic".....LOVE IT! After another walkthrough we decided that The Fireside would be turned over from the ceremony to the reception during the two hour cocktail reception. I am in the industry and plan wedding with 300, 400 & 500 guests every weekend so I knew that I wanted a small more intimate wedding to avoid all the craziness. The Fireside room was perfect as it seated 90 guests and that was it we had our invite LIMIT 90!! We couldn't budge since the venue space was a 90 guests space and we love that we had to stick to that no matter what. After all that all that was left was our dancing area and other surprises area. I love when weddings have different spaces for guests to visit and wander to and not be confined to their table and thats it! ZED451 has another event space right off the Fireside room called the Mezzanine that is gorgeous and open to the main dinning below. After being in the Mezzanine I knew it was perfect as its openly divided into a few spaces that we could play with. That was it floor plan DONE & DONE! Here are a few images with before and afters of the spaces & descriptions. Before shot of ZED451 double sided fireplace. This is the area that we set up as the ceremony altar. After of the ceremony area set up. We flanked the fireplace with two pedestals covered with grey pintuck fabric. Each side had a collection of three different floral pieces. The first glass cylinders were placed on the pedestals filled with a giant manzanita branch, crystals, hanging votives, hydrangea, vendela roses, freesia and orchids. I absolutely love how everything turned out and think It made for a unique and magical altar. 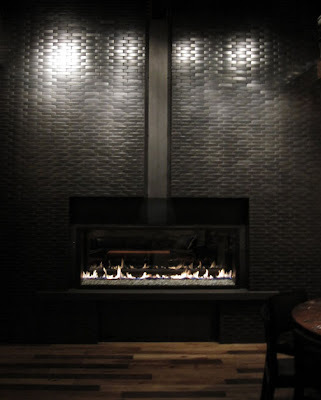 Before image of ZED451 Fireside room. After close up shots of table designs for reception. Full after shot of Fireside room used as reception area. We used two different centerpieces for interest to the eye and to balance the heaviness of the crystal tree centerpiece. The secondary centerpiece was a collection of tall cylinder vases holding hydrangea, vendela roses, freesia & orchids. I also added crystal hanging from the vases to make them cohesive to the trees. All before images by: Just Say Yes Events!